When relocating, along with finding new doctors, a good hairdresser, a vet who will care for your critter, all of that, you must also find a new photographer. Now, things have changed significantly since I last needed to hire a fine art photogrpaher. I had someone I adored in Albuquerque, did great work, affordable, really nice guy... But this was back in the days of slides. In the interim, in Philadelphia, my dear brother took my painting photos, and then I did all the adjustments in Photoshop. That worked. Now across the country, and nowhere near my brother, and with a new body of work ready to go out into the world, I really needed high-quality digital images. But I could not find anyone who was both affordable (for me) and did good work. The thing is, half of what I was going to be charged for was the Photoshop half, and I was already a pro at that. Plus, I wanted the RAW images of my work, and no one was going to give them to me. So, with the money I would have spent on a photographer, I bought a DSLR camera. A little stress, some studying for a week, along with a few sessions of trial and error, and I now have images that are good enough for my website, submitting to calls-for-entry, filing for copyrights, and for printing cards. And if I should ever need a large-scale format for printing posters or something, well, then I will hire a professional. But I'm a picky kitten when it comes to my work, and what I was able to do is as good as anything that has ever been done for me before. And now I have a really good camera, as well as the images I needed. You might be able to do this too. Settings: Aperture Priority, seven bracketed f-stops between 5.6 and 11, ISO 200 (best for Nikons for some reason), slooooooow shutter speed (but still no more than one second), and 10-second shutter delay... Also, a polarized filter, a soft-box light set, and a borrowed tripod. Yum! I've been settled now for almost six months. I remember telling myself, three years ago, that once I've been settled for six months, my life will finally restart. I thought I was moving back to Boston in 2015. I was even accepted, from a few states over, into the Boston Redevelopment Agency's artist housing program (as a former resident and with enough credits to be considered an alumnus of Mass Art, I had something of an in). But it was not to be, due to the lack of availability of live-work space at that time. I am still partially in mourning for what could have been. It was something of a journey, 2015, one of those turning point years. I've written about it extensively in lyric poetry, and painted about it some. These things take time to process. There will be more. The material is rich, and some aspects still need deeper expression. Portland, Oregon is now my home. Well, actually, my residence is outside of Portland, but my painting studio is well inside the city limits. For the first time in over 20 years, I have a studio space in a studio building, and it's heaven. I've been working in this building since the Fall of 2016, but in my current space only since last August, and I've been painting whenever possible since the tail end of 2016. A few weeks ago, with much trial and error, I taught myself how to photograph my own work. 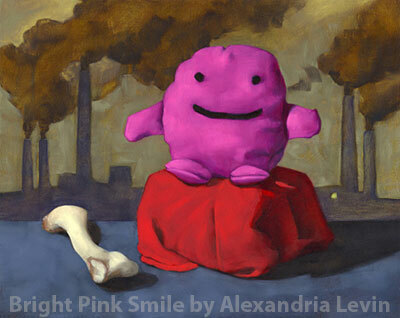 Last week, I updated my painting site for the first time in three years, with 25 new paintings. 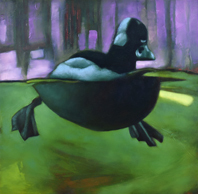 One of those new paintings is featured in this post, titled 'Buoyancy'. A larger version is on this page. At the beginning of this year, I did another thing I have not done in quite awhile. I made a list of all the things I wanted to do, with realistic expectations. One was to post in here at least once a month, even if only five people end up reading it. Oops. I missed January. I'll make up for it this month. 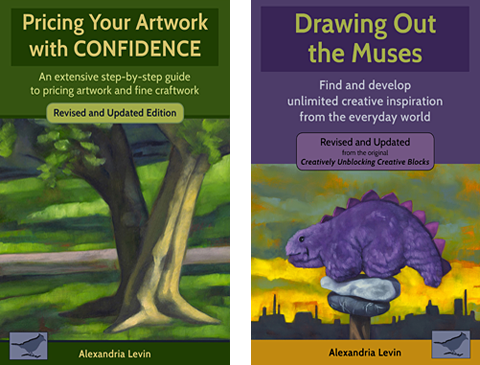 All images and content ©2009–2016, Alexandria Levin. All rights reserved.